It can be difficult to focus on the music at (Le) Poisson Rouge, a venue “serving art and alcohol” on Bleecker Street in New York. During any of their widely varied avant-garde and new music sets, you will hear forks clinking against plates and see waiters striding across the space to deliver drinks to the audience members, seated around tables or at the bar. This held true during Taka Kigawa’s Monday night piano concert of works by John Zorn, Sean Shepherd and Elliott Carter: a program that turned out to be perfectly suited for the atmosphere. 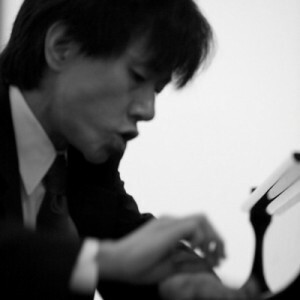 Mr Kigawa lives in New York, but grew up in Japan and studied piano both in Tokyo and at Juilliard. He is unassuming, almost reserved, at the piano, which is part of why many of the sounds in John Zorn’s Carny were surprising and at times even comical. The program was mysteriously blank beneath this work title, while the other three works had neat little paragraphs beneath them. But Mr Kigawa explained that this was purposeful: he had called John Zorn to ask for program notes, which were denied in favor of letting the music “speak for itself”. The music, rambling from watery melodies to jazzy phrases to almost mocking mini-cadences that rippled outward into chaos, seemed to be speaking in many languages. Mr Zorn, who turns 60 this year, successfully amalgamates a variety of genres into his works, including jazz, pop, rock, metal, classical, and klezmer. Even Carny, a solo piano work, contained a little of everything. The notes collided in clever, interesting ways, one voice roving beneath recurring snippets, the two voices at times stumbling like toddlers on to the next section. At one point both hands interrupted themselves as Mr Kigawa slammed his arms onto the keyboard for a bit of a refreshing tone cluster, and the ending was quiet, almost fluttery. The program notes for Sean Shepherd’s Preludes were a bit more extensive, drawing attention to the pensive nature of the three pieces. The first and third preludes were thoughtful and almost exquisite, tinkling occasionally in the manner of a music box. The second prelude was more playful as it rumbled and romped along in cute rhythms, culminating in a quotation of Brahms’ famous Lullaby and finishing with a rude awakening. The two most exciting pieces on the program were Elliott Carter’s Sonata and Night Fantasies of 1945 and 1979–80, respectively. Throughout both of Mr Kigawa’s interpretations, I found myself nearly in awe, both that a human had composed this music and that another human was playing it. The Sonata alternated between stately chords and choral sections with frantic notes split open and running in all directions, an effective display of the complexity and challenges of Carter’s music. The Night Fantasies, a “modern-day Kreisleriana”, oscillated between intricate harmonies and scattered dissonances. The swift mood changes were reminiscent of Kreisleriana composer Schumann himself, giving me the sense that even the most “random” chords or phrases had an underlying (though perhaps inexplicable) meaning. Rather than parse this out, I set aside my pen and notebook and rode the choppy, uneven waves of Carter’s music to the end. Does this music’s arguable “lack of coherence” make it any less worthwhile than Schumann’s Kreisleriana itself? I don’t think so, and I think Mr Kigawa did a spectacular job of reminding us all that modern personalities and harmonies can be rendered in such a way that is both dramatic and meaningful. Carter’s music, while well suited to the slightly unfocused vibe of LPR, sounds just as grand – beautiful, even – in a formal recital hall. The people and the setting might change, but the extraordinary notes will always flow from one to the other in the invisible pattern of their seemingly random existence.